It was a blazing mid-March afternoon in Ahwa, 130 km from Surat. Some "modern" men were enacting what seemed for all practical purposes a medieval drama. The lawns of the Ahwa collectorate, the headquarters of the Dangs district, were suitably decorated. The local maibaaps (virtual satraps) -- the district's bureaucrats -- droned on about tribal welfare to a bored and somnolent audience. It was the annual Dangs durbar (royal court), a ceremony dating back to the previous century. Four inebriated rajas, or heads of clans, were heralded in with music and fanfare and seated on chairs on the rostrum. On the lawns and the nearby ground, it was fete- time. Hawkers with cheap, tacky trinkets (the "ethnic" stuff for sahariababus, the urban gentry), giant Ferris wheels, magic shows, and state-sponsored cultural programmes, mostly local dances, continued amidst shrill approval from drunken revellers. None of the officials could identify the rajas by name. R S Meena, development administrator of the Dangs, who had arrived from Gandhinagar, made a valiant attempt at reading them out, stumbled and finally gave up. In the end, P C Tripathi, the district collector, handed to the 4 rajas and 9 nayaks (minor royalty) the annual privy purse (SEE BOX) of Rs 9.7 lakhs. The merry men also received shawls, turbans and several sets of clothes. Did some of the Dangis in the fete remember their old goth (legend) about how they lost the forests? : that the gora sahebs (Britishers) had come, many, many moons ago, with 3 sacks and asked the rajas to choose any 1. The first had soil, the second bark, and the third was packed with money. The rajas chose the 3rd bag. So the gora sahebs had said: "You have chosen the money. So be it. We shall keep the soil (forest) and the bark (trees)." Meanwhile, 40 km away, in Khatar village, which sits amidst sylvan hills, scantily clad men and women from 20-odd villages poured in to attend the meeting convened by the Dangi Lok Adhikar Samiti (Dangi civil rights organisation), a fledgling mass organisation. Many of them had walked through the night on empty stomachs. The Samiti was planning to prepare strategies against the Forest Department's (fd) forcible eviction of cultivators from the reserved forest land in several villages, despite stay orders from the Ahmedabad High Court. It was time for some action against state oppression, which is as old as the creation of the fd itself. These 2 different conglomerations tells the story of the Dangs more succinctly than anything else: the sold-out local chieftains, the outsiders capturing land and forests, abject poverty and frustration... history keeps repeating itself. Companions in misery The Dangs consists of a series of foothills between the flat alluvial plains of South Gujarat and the high mountains of the Sahayadris -- the range which divides the coastal belt from the rugged plateau of the Maharashtra Deccan. With an area of 1764 sq km, Dangs is Gujarat's smallest district, and the only one in the country owned almost solely by the fd: 98 per cent of the land is controlled by it. Reserved forests constitute 91,244.58 ha and the Purna Wildlife Sanctuary 299 ha. The local people have left for themselves the protected forests, measuring only 55,260.09 ha. Even on these farming rights here conditional. The society is considerably stratified. There are the ruling Bhil chiefs; their relatives, known as bhaubands, or the ordinary Bhils; and the subordinate peasants, known as Gavits. The 1871 census recorded 7426 Bhils and 9310 Gavits in the Dangs. The latter were divided by jati (caste) into 6517 Konkanas, 2412 Varlis and 302 Gamits and others. While the social hierarchy still holds, by 1961 the Konkanas (28,576) had outnumbered the Bhils (23,701). Today the local elite is predominantly from the Konkana tribe. Poverty is increasing every day. Increasing pressure on land has led to "encroachments" of the reserved forests, leading to frequent clashes with the fd. The State has brutally suppressed any organised dissent, branding it as naxalism. Utter lack of development has added to the people's woes. The budget outlay for 1994-95 is Rs 1878.07 lakhs. But past experience shows that precious little reaches the people.According to Madhusudan Mistry of the Ahmedabad-based ngo, DISHA (Development Initiatives for Social and Human Action), 70 per cent of the Dangs' budget is spent on non-developmental expense. Mistry says, "The per capita expenditure in the Dangs is Rs 1270.27. Yet, 98 per cent of the population has been living below the poverty line for years. Ironically, the government will raise more than Rs 19.15 crores this year by selling forest produce alone. Its total income from this district will be Rs 19.90 crores." Centralised forestry dates back to the creation of reserved forests (the equivalent of today's protected forests) in the 19th century. The Raj officialdom believed that the forests were the key not only to wealth, but also to controlling floods and droughts. Hence, a stringent protection regime, an authoritarian control of both nature, and the human beings who lived in its lap. Tribals spelled trouble. The attitude prevails even today. Vasantbhai D Parmar, former Collector, described the Bhils as "most primitive, lazy fellows who just refuse to work. All they do is reproduce and cut the jungle." This almost ideological conviction percolates down to the lowest strata of the bureaucracy. For the nature-worshipping Dangis, however, forests are not just a way of life, but their spiritual home too. Its value cannot be counted in cash terms of timber sales. As Gulab Pawar of Dhundhunia village says, "You see our wooden houses, or that we lop the branches and burn them to fertilise our fields and accuse us of wasteful practices. But we have always survived that way. We don't destroy the forests." Skilletted on the trident of the forest, revenue and police departments, the people see organising themselves as their only hope. "India became free in 1947, but we still remain slaves of the fd," says Mahadu Avsu Pawar of Ghodi. "Unless we come together, no one will bother about us. We will have to fight for our rights to cultivate, to felling timber and to the forests. It is a fight to survive." Mahadu was arrested and thrashed mercilessly in 1992 for being "a naxalite". Even today he limps and his rib cage often aches, but he has not lost his spirit. The latest in the long history of the Dangi's rebellions against the fd took off in 1991, when 2 Marxist-Leninist activists of the Chandra Pulla Reddy group came here and organised violent protests. People from 14 villages joined them. Widespread arrests, sexual harassment and torture and deaths finally squashed the "revolution". But the misadventure left the administration with a stick to beat the daylights out of any dissenter... "naxalism" cannot be tolerated. Nevertheless, the unrest had some positive effects too. "While the 14 villages which were involved still face a tough time, the overall situation has improved a little. Drinking water is not that much of a problem as it used to be earlier. The officials do not openly treat the adivasis with as much contempt anymore," says Kasimbhai Mohammad, a jeep driver from Waghai. "But most of these changes are superficial and placatory. The land issue remains unresolved." Popular unrest forced the Gujarat government to pass a resolution in 1992 which said that cultivated encroachments prior to 1980 could be regularised subject to certain conditions. The claimant, who should be a local adivasi should have cultivated the land at least once before 1980 and his name recorded in the fd's offences register at least once. Other documentary evidence, like administrative agricultural records will also be accepted. A maximum of 3.24 ha would be regularised and the claimant will pay revenue to the fd. The claimant is expected to cultivate half the land and devote the other half to plantations of teak khair and prosopis. Once the list is finalised, it is to be announced in the village by the fd. Those not included will be given a month to apply to the Collector for redressal. The applications will be reviewed by forest and administrative officials. If the land has been under plantations after 1972, alternative land will be given. The officials will pass on their recommendations to the state government, which will then seek clearance from the Centre. If it is obtained, the government will survey the land and issue pattas (deeds). Trees planted prior to 1980 will belong to the fd; the rest would belong to the cultivator. According to E Balaguruswamy, chief conservator of forests, Surat Circle, the survey is still going on. Meanwhile, in 1993, with the help of Girish Patel, a lawyer associated with the Lok Adhikar Sangh, a civil rights organisation, cultivators in many villagers got stay orders from the Ahmedabad High Court to prevent their ouster. Says Patel, "The court passed orders to maintain the status quo till the final disposal of the issue." In 1994, Balaguruswamy filed a caveat in the Gujarat High Court, that the fd be consulted before such orders are passed in future. In January and February this year, the fd forcibly evicted 7 cultivators from Kandolpara, 17 from Pathri and 8 from Khatar villages. In Kosimpathar, itchy missiles (made of dried stinging nettle leaves) from the women vanquished the raiding officials. Most of these villagers had hc stay orders against eviction, but the officials did not relent. Says Balaguruswamy, "Do you think the villagers would have kept quiet if we had really violated the court orders? And in any case, the department will not do such things. The court orders were not general orders and the evictions took place only after detailed investigations." Yet, many of the villagers have been cultivating the land for more than 20 years. Oral testimony and visual evidence shows clearly that the fields have been cultivated for long by them. But state's brute force has ensured a sort of omerta. 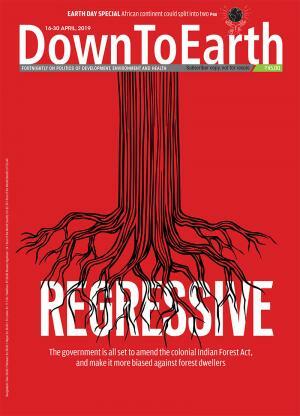 "Our plight will worsen, unless something is done immediately, " says Gulabhai of Dhundhunia, "We have to get rid of the fd and be allowed to cultivate land. We need development and industries." In fact, the district development officer, R G Pandor himself stated at the durbar, "The people are poor. No development has taken place so far." There is no industry to speak of. The district's only cooperative poultry farm is at Chikhalda village. But membership is restricted to the family of the "owner", Devrambhai Jival Bhai Gain, a Konkana. Says Gain, "I got a loan of Rs 5 lakhs to start this business. I have 4,400 chicken and make a substantial profit." Forest labour cooperatives were once projected as a major state development scheme, but now they have all been cornered by the rich leaders. Jinabhai Darji, the Congress (I) political strongman of South Gujarat, who resides in Vyara, runs several carpet weaving centres in the Dangs. These centres largely employ children, who are paid a pittance, sometimes even as low as Rs 150 per month during the training period. The carpets have national and international markets. Kalidas Pawar, of Dhundhunia village says, " The parents send the children over because of the little money they earn. But should the children not be in school?" In 1972-73, all the 80 families from Saputara village were displaced and a sprawling hill resort constructed there. Tourism is today a major money-spinner here. The oustees, now 175 families are housed at Navagam but have not been given land. They have now been reduced to labourers. They were given Rs 1,800 per acre, some thatched houses, and later, 800 tiles each. Ganpat Lakshman, a villager says, "To make a house I need 2000 tiles. The houses they gave us were so bad, no one could live in them. We had to build new ones." Narayan Bende Gaekwad, 31, looks wistfully at the fancy tourist-attraction ropeway and says, "We don't even have regular bus services to our colony." Eknath Yashwant Gaekwad, a 3rd-year BA student who has to travel 35 km to Ahwa, wrote to the transport authorities about improving the bus services. He threatened to launch a satyagraha. The police, he says, are now looking for him. Water is scarce everywhere inthe Dangs, except in Saputara. According to R S Meena, the dfo, North Dangs, the District Rural Development Agency has constructed about 2,700 wells in the past 3 years, but 1,600 of them have collapsed. "I doubt whether more than 50 per cent of the remaining work," he says. The Dangs is a merry hunting ground for contractors, who mint money, making bridges and roads, most of which don't last through 1 monsoon. "Its natural," says Barry Underwood, presently the chief executive, Aga Khan Rural Support Programme, "I have seen so many constructions where not more than 20 per cent cement is used." Underwood lived from 1979 till 1984 in Sarowar, setting up the Gram Vikas Mandali Trust Association (GVMTA). Most of the contractors are sarpanches (chiefs) of villages. The contracts are their political perks. Most Dangs villages have been electrified, officially. Indeed, the people have all deposited their dues more than 1 year ago. But only a handful of homes in each village have meters, and in the evenings they "hook on" (tap) electricity to light 1 dim bulb. A few missionary schools and ashramshalas (state-run residential schools) manage to impart some education. But the situation in the government primary schools is deplorable. Says Kalidas Pawar of Dhundhunia, "Master log marte jada hain, padate kum hain (The teachers beat us more often than teach)." Expectedly so, because most them are outsiders and hold the tribals in contempt. "A majority of them, including the headmasters, are found in the daaru (liquor) shops during school hours," says Taraben of Khatar. She also speaks of humiliating social discriminations: "Forget about letting us sit in buses, the officials and the outsiders ask us to move away if we go near them. We stink, they say." The news about a dam slated to be constructed at Gira Dabdar has heightened uncertainty. "Officials come once in a while and conduct surveys and tell us that we will be shifted. But no one knows exactly who will be shifted or when," says Mainuben. Even the previous collector Vasantbhai D Parmar did not know, and the present one says he is too new. Similarly, Baijubhai Made of Sawarkhadi, one of the 26 villages on the boundary of the Purna Wildlife Sanctuary says, "The forest guards often come and tell us that we will be thrown out. Many surveys have been done. Will someone tell us what our fate is to be?" The Dangis need desperately to get out of the trap of poverty. Development is the obvious solution. But the fd says it is helpless, because development is the revenue department's baby. Balaguruswamy says, "There has to be a legislative change. The fd should be made in charge of development too." The Dangi culture as well as their economy has historically been based on their basic control over the forest. And the only way out of poverty is to reintroduce that past association with the forests and its produce. This is not possible in the present situation, where the foresters and the people are sworn enemies. Can the rules not be relaxed, given the traditions? Balaguruswamy defends his department, "I am tied and bound by the law to protect the forests." He asks, "Will chopping down all the forests solve the problems? The soil erosion will ruin whatever little the people can grow." But a senior non-forester administrator said, on conditions of anonymity, "The fd has always wanted more powers. And as for enforcing law, its a joke. 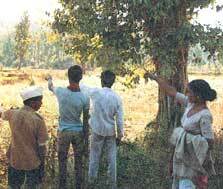 Why, even a college lecturer in Bardoli got permission to cut his trees after 18 years of running around. Imagine what happens to the Dangis." He says even food, fuel and fodder are not supplied. "The fd's notion of minor forest-produce has to change. The pattas for house sites and for cultivation of protected forests have to be given immediately, in keeping with the Dangis rights. Even the last Working Plan of the fd, drawn up in 1970, mentions this," he adds. Even the ngos feel helpless. Says Underwood, "We need mass organisations, like the Village Mandalis." But the last director of the GVMAT, Motiram Vadu of Hanwant Chond village, says, "Organisations are not possible right now. Even the GVMAT was broken up and our workers harassed. Our offices were shut down and papers seized." There is a big market for the Dangs' organically produced food not only in Surat and Baroda, but all over the country. Some very fine varieties of paddy, like ambamou, are grown here. But the farmers have to sell a major part of their crop immediately after harvest at very low prices. If these are marketed properly, with organic-food labels, the Dangis would have to sell only their surplus and yet earn enough to get them out of the trap of poverty. Joint forest management, watershed development and agroindustries are possibilities too. But for that, the officials, especially the fd, need to work with the people and not against them. Already, such precedents exist in South Gujarat, especially in the Mandvi region, but the challenge is to extend that to the Dangs.